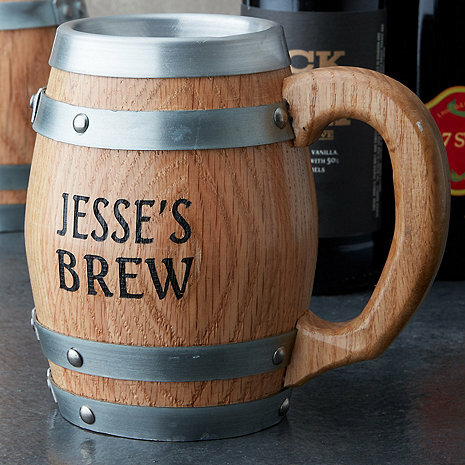 Quench your thirst with this authentic barrel mug. While beer is the obvious choice, this mug is also perfect for cocktails and even hot beverages. This mug is made from 100% solid American White Oak and authentic steel hoops with a food safe stainless steel lining. Specify single line name for personalization. Can be used for hot or cold beverages. Hand washing recommended. **"Brew" IS automatically included on the mug. This item ships directly from the manufacturer. Please allow 2-3 weeks for delivery. Select items will have additional shipping charges, please see above for this item's additional shipping charge. Can I get it without Brew? BEST ANSWER: Hello Heather, we do offer custom personalization depending on what you were looking to have printed. Please reach out at 800-356-8466 and our sales department will be able to assist you with any custom personalization needs. Thank you! Can I get one not personalized? I was really pleased with the barrel stainless steel mug. It is a beautiful gift for any beer drinker. My one dissappointment was the fact that I thought the name I asked to be put on the mug would have had an ' s after the name just like the one displayed. I understand this was my error but I wish I could have been notified as to whether I wanted that placed after the name. This has no reflection on the quality of the item, which was worth the price paid. Very happy with the order and product because everything is very accurate. Shipping was within the specified time window, and the mug looks exactly like in the picture. Good quality. The quality is outstanding. The mug keeps your drink cold and holds a lot. I have gotten many compliments on this mug. Worth the price. Great mugs, but too expensive. Even with free shipping paying $100.00 for two mugs is a lot to begin with and cannot go more than two. Also, engraving should be darker. However, the mugs are solid and heavy.